On Saturday morning, November 24 we departed Chicago Midway Airport where the temperature was 20 degrees (F), and at noon we were treated to a balmy 74 degrees at Fort Lauderdale Airport. Put away the fleece and back into T-shirts and shorts! Now is when I love living in Florida! 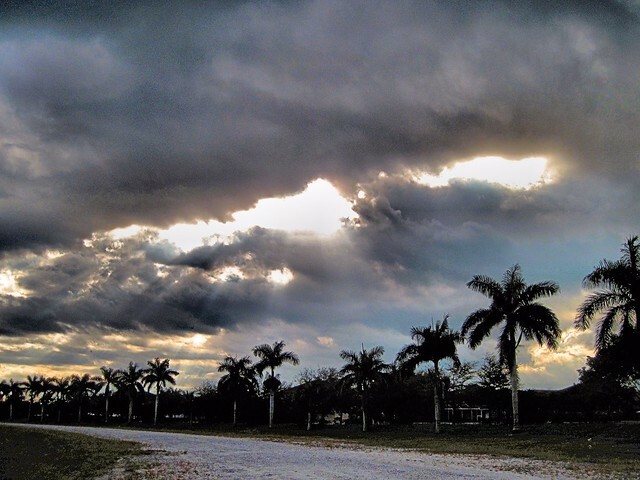 South Florida enjoys two seasons: Hot and wet from June through September, and mild and dry from October through May. We had departed for our second home in Illinois in late October, after a period of abnormally abundant precipitation. Our lake was filled to brimming. 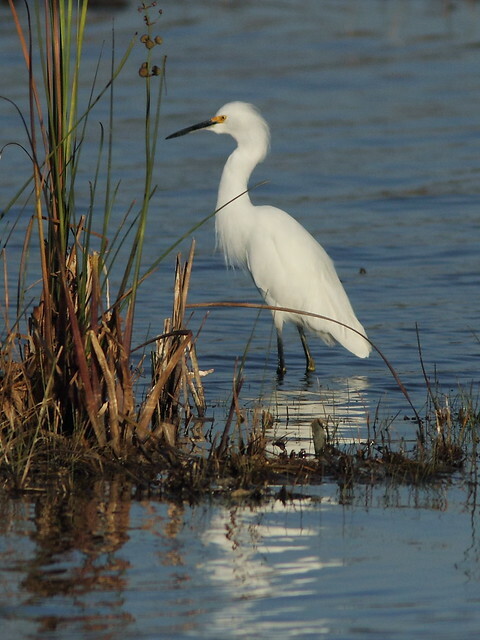 Birding had been slow in our local birding patch next to our subdivision because because fish and other aquatic prey were diluted in the high water, dispersing the long-legged waders throughout the Everglades. Hurricane Sandy brushed by just after we departed Florida, delivering high winds and beach erosion but little moisture. After that, temperatures moderated and rainfall was scant. Our lake has receded about two feet since our trip north, and now its margin no longer reaches up to cover part of our back lawn. We slept with open windows, and early the next morning wasted no time getting back out on the gravel road that extends a mile from the entrance of our subdivision into the water conservation area. As usual, we started out walking briskly, Mary Lou in the lead, while I lugged my binoculars and camera gear a few paces behind her. 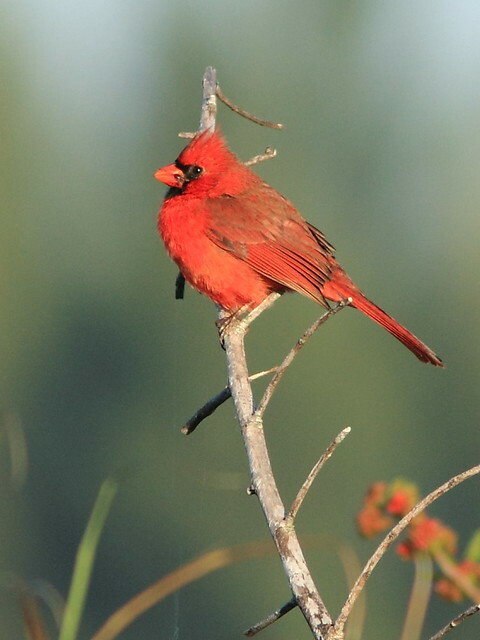 She pointed out a nice Northern Cardinal along the path. Of course I stopped to take his picture, then struggled to keep up, feeling like a toy poodle on a jogger's leash. Ahead, we beheld an unusual and welcome sight as we approached the Harbour Lakes mitigation impoundment (a fancy name for land set aside by the developer to compensate, rather symbolically, for the damage caused by draining and filling the historic Everglades to build our homes). 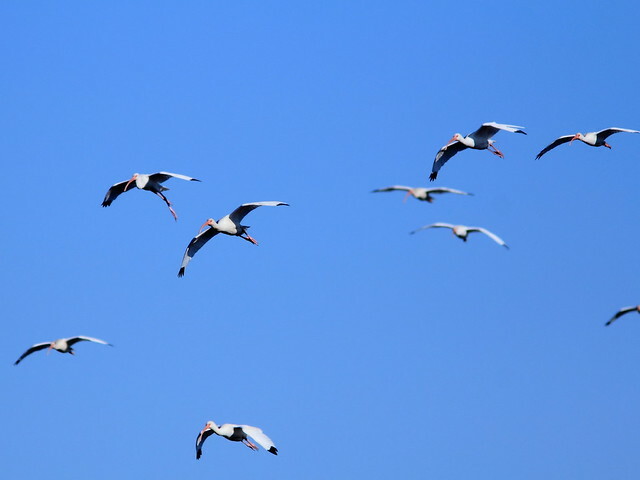 The white forms of scores of ibises, egrets and (Holy Cow!) 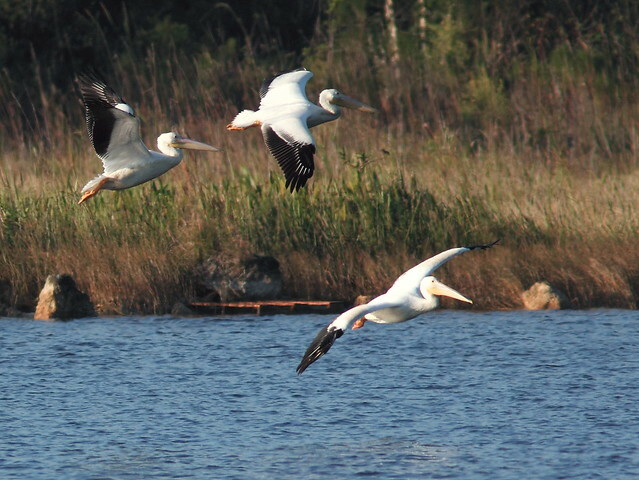 American White Pelicans circled over the lake. 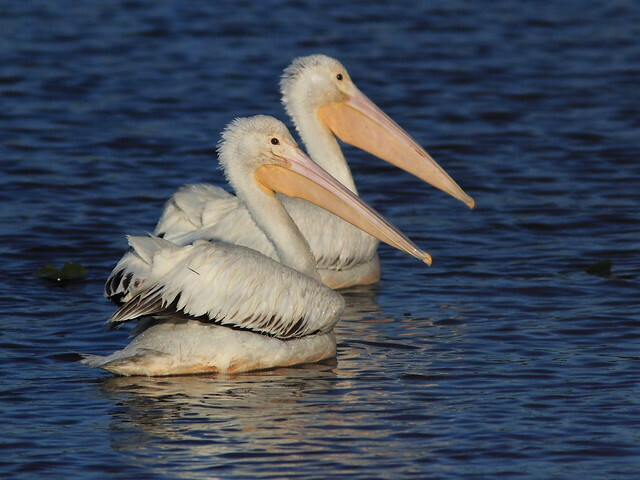 Since moving here in 2004, despite our nearly daily walks, we had never encountered pelicans on our birding patch. The pelicans fed cooperatively, driving a school of fish in front of them as they advanced in a line. Lower lake levels had concentrated their prey into a nutritious "soup." I counted 23 pelicans. They approached closely, following the frightened fish up to the shoreline. 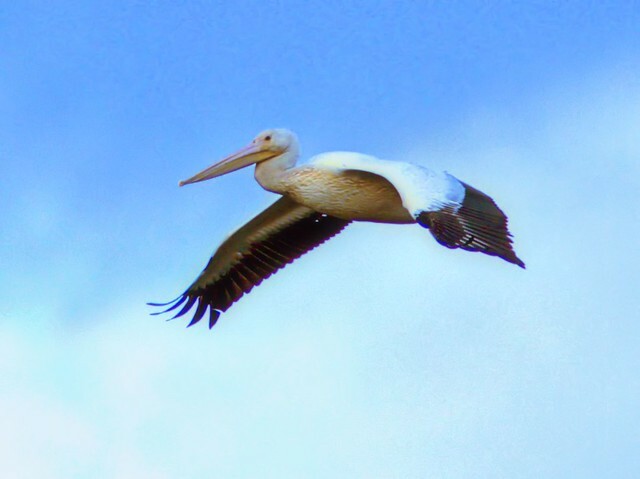 Masters of flight, some of the pelicans wheeled overhead. By now I had fallen far behind Mary Lou. 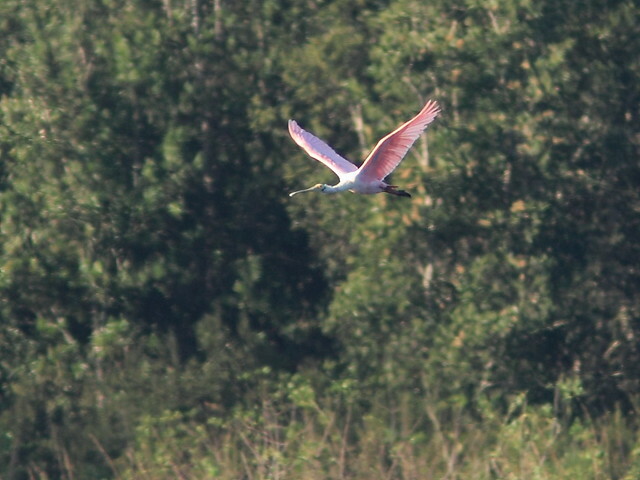 I barely heard her shout: "Spoonbills!" Yes! 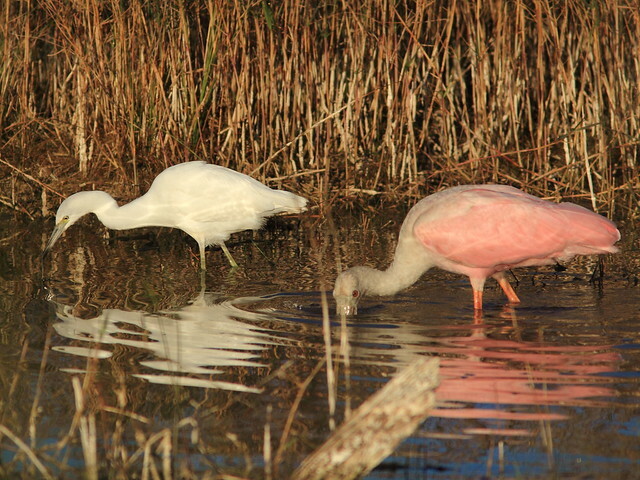 Three Roseate Spoonbills dabbled with the storks, ibises and egrets, up close and personal. 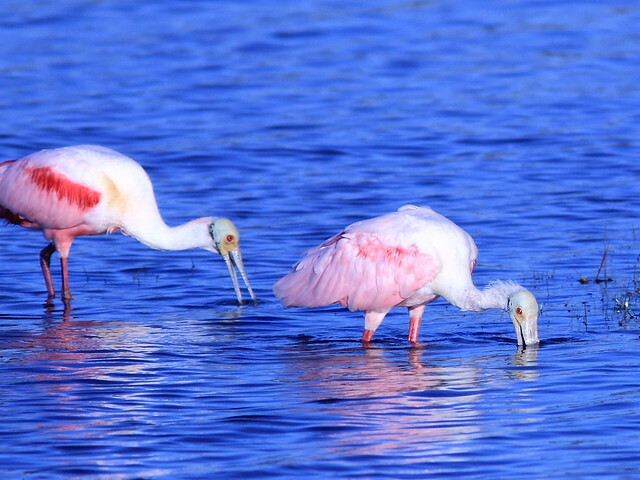 (Two days later on November 27, a fourth spoonbill was present). 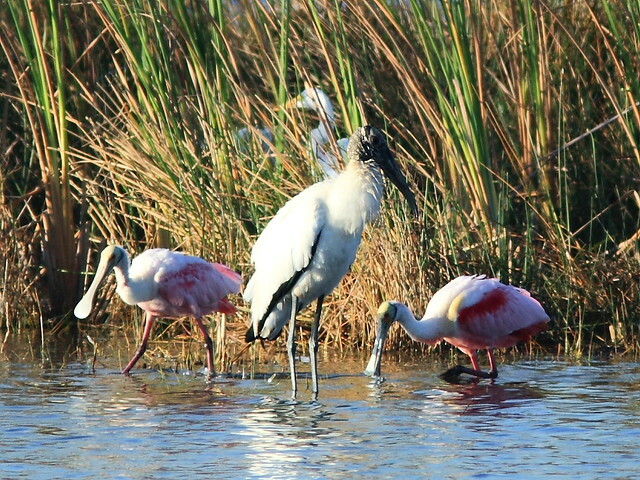 This video clip shows the spoonbills' feeding technique. A Great Egret flew in to join an immature Great Blue Heron (note its darker plumage and black cap) that was feeding with the spoonbills and pelicans. 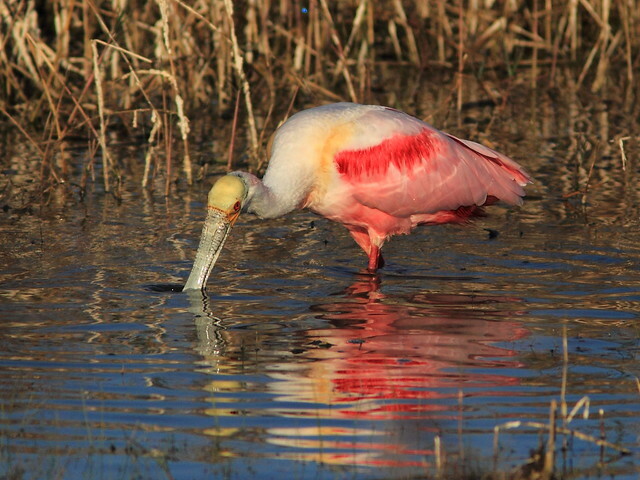 Like storks, spoonbills are tactile feeders-- they sweep their specialized bills and clamp down when they detect their prey, which consist mostly of fishes and other aquatic animals. The water is just the right depth to keep their eyes from being submerged. 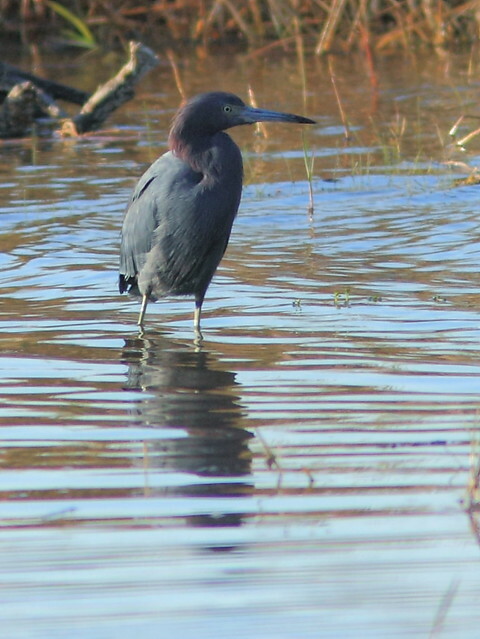 This immature Little Blue Heron is a sight feeder. 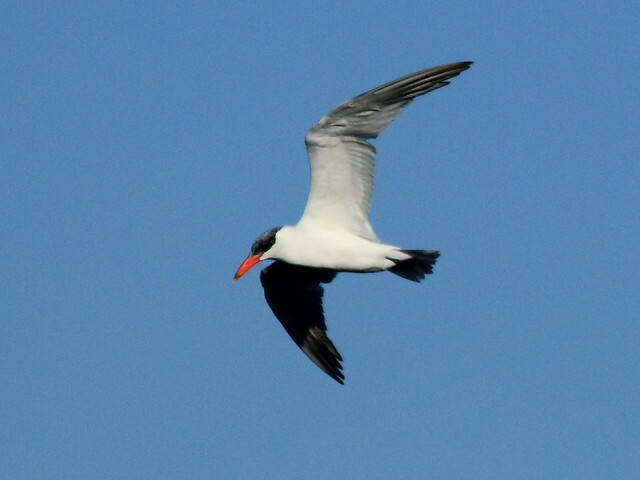 It adapts the typical posture of its species while stalking for fishes, the tip of its bill just above the surface of the water. 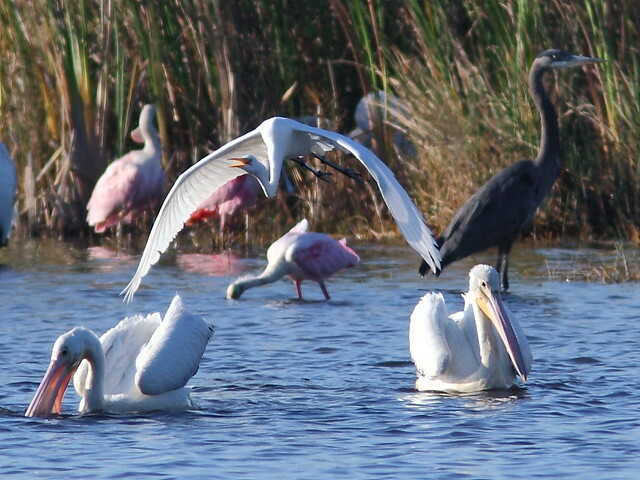 In this interesting shot, both a spoonbill and a pelican are demonstrating how they use their bills as strainers. 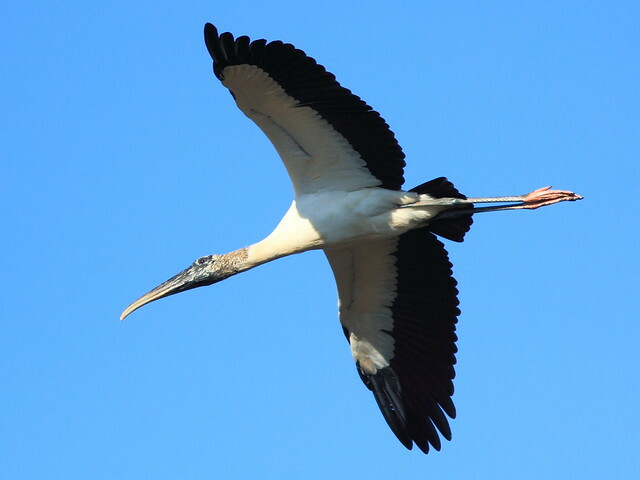 A Bald Eagle flew over and at least a hundred egrets, herons, ibises and spoonbills took flight. The pelicans seemed not to be disturbed by the predator. 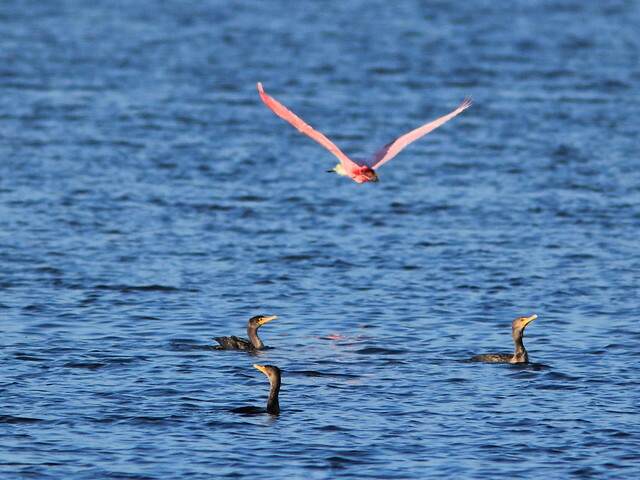 Three drab Double-crested Cormorants watched a colorful spoonbill fly by. I call this photo "feather envy." 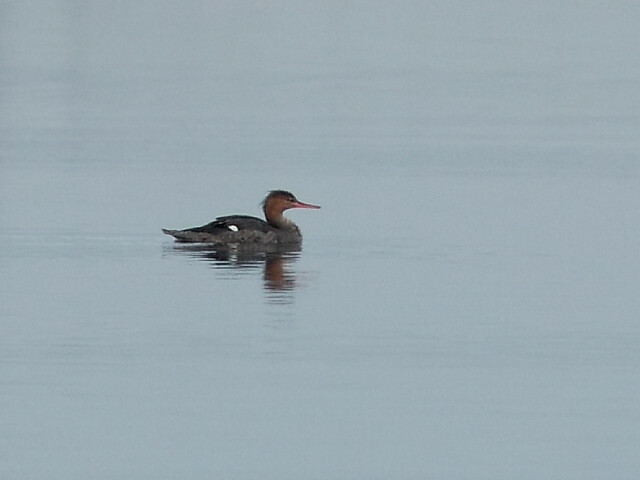 ...and four distant Red-breasted Mergansers. 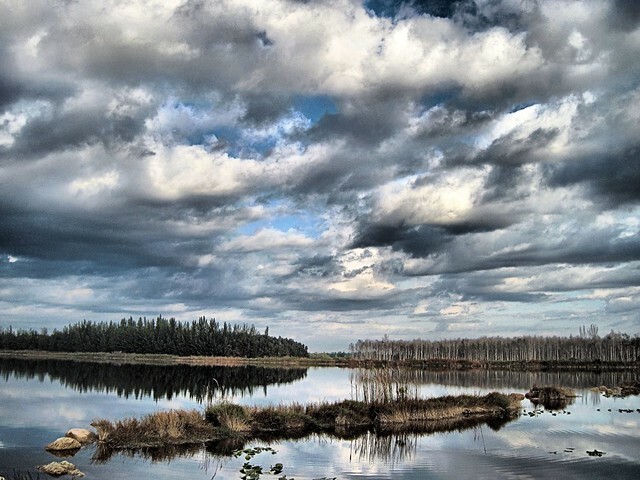 On our second walk, clouds gathered over the impoundment. Note the grove of exotic Melaleuca trees to the right. They were treated with herbicide a couple of months ago. Two years ago, a pair of Ospreys nested there. Soon they will be cleared to make way for the highway extension that will also result in the paving of our beloved gravel road. Progress! Our walk was cut short by a rain storm that came up suddenly. This is the view in front of me as we hurried home. The shower lasted only a few minutes. Wow Ken great stuff! Really excellent photos and video. What a busy place that patch is turning out to be. Great post, Ken! 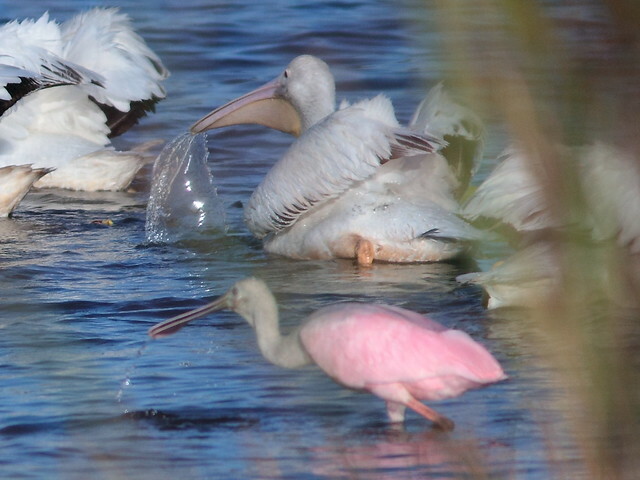 I love the Pelicans and the Spoonbills. Looks like an awesome place to see the birds. Great post Ken! I really like the video. I can see that kind of video being added to digital field guide apps to really help birders learn to recognize bird behavior, sound, size and shape, and color pattern. Always cool to see new patch birds. Sounds like a very delightful walk. 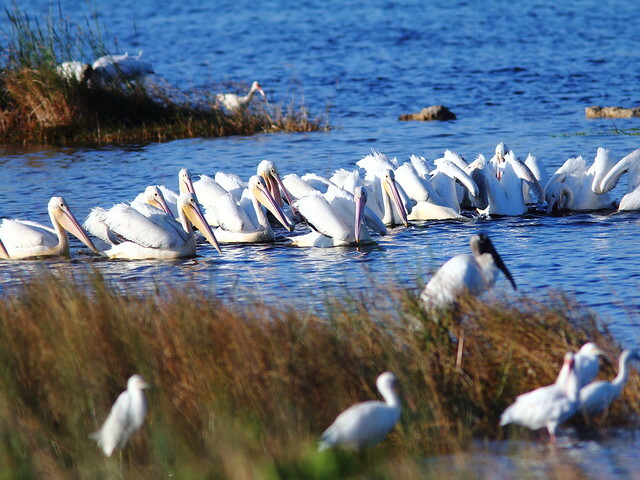 It's fascinating the way the White Pelicans were feeding in a row. Terrific images! 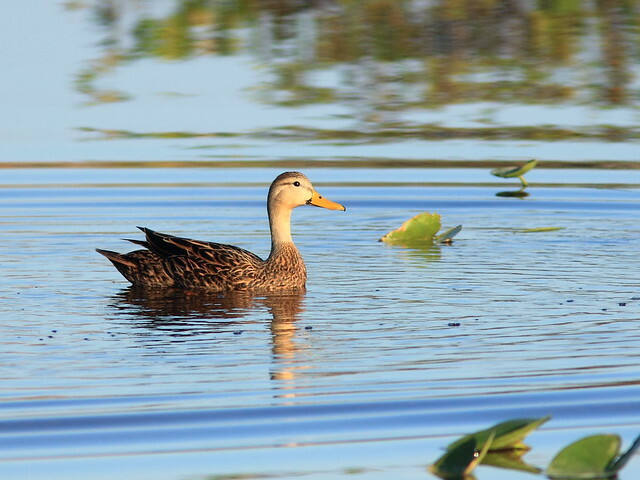 I recently vacationed in Florida and saw all the beautiful birds featured here in this wonderful blog post. Wow - Can I come along on your next walk? 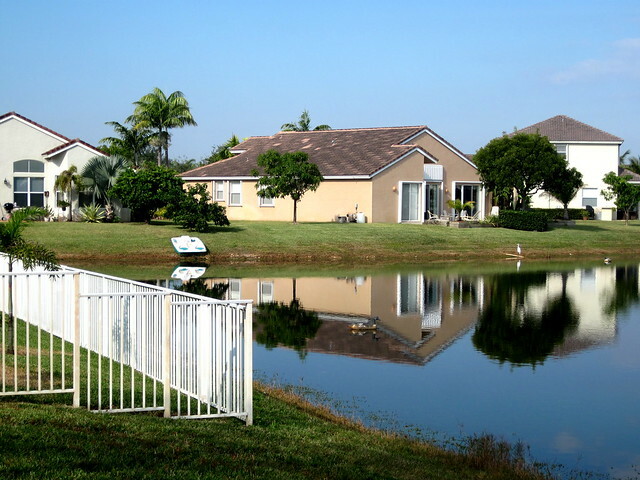 What an amazing spot you have for wildlife! Really enjoyed your videos and photos. Wonderful post, Ken! Each photo is exquisite. 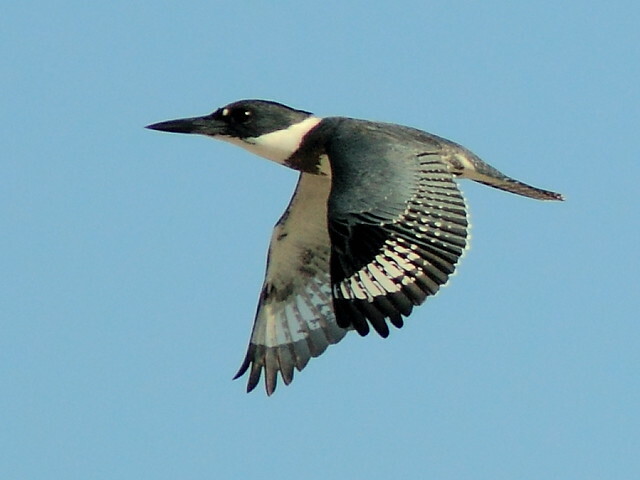 I love that Belted Kingfisher! Very nice post and wonderful photos! !